The Snow White Christmas Cookie by David Handler: Synopsis and Online Purchase Options. 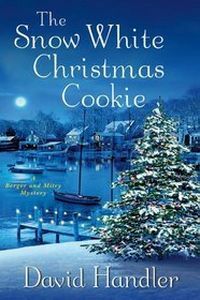 Synopsis (from the publisher): The newest adventure featuring the mismatched romantic crime-fighting duo of New York City film critic Mitch Berger and Connecticut State Resident Trooper Desiree Mitry presents Des with her first taste of Christmas in the historic New England village of Dorset. And what a taste it is. Three blizzards have blanketed the village in forty inches of snow. Bryce Peck, Mitch's blue-blooded neighbor out on Big Sister Island, has just been found dead of a drug overdose. Young Kylie Champlain has slammed her car head-on into an office building after she's caught trying to shoplift a pair of Ugg boots. And a grinch has taken to stealing the mail from Hank Merrill's postal route, which happens to be the main route through the historic district. Stealing the U.S. mail is a serious federal crime, but Des soon discovers that she's onto something much bigger: a black-market prescription drug gang with ties to organized crime. And now a fourth blizzard is on its way. And so is another murder. And, somehow, the man in her life has managed to land himself smack dab in the middle of the whole mess. Not to mention that he's in way over his head with Josie Cantro, the beautiful and treacherous life-coach who just may be responsible for it all. If Des doesn't act fast, this will truly be a Christmas to remember — but for all of the wrong reasons.